The Freed Thinker Podcast - A Tyler Vela Joint: Will Boghossian go with the evidence or blind "faith"? Will Boghossian go with the evidence or blind "faith"? For those familiar with Peter Boghossian's work you will no doubt be aware of his latest book A Manuel for Creating Atheists. In it he gives some rather strange (re)definitions of the word faith as being "belief without evidence," "pretending to know what you dont know" or "believing something with more confidence than what the evidence warrants" and he claims that this kind of "faith" is the modus operandi for religious believers. That we extol this kind of faith as a virtue and use it as our primary epistemology - that we use it as our method to gain knowledge and understanding. For decades Christians have long been rejecting this is a false definition of the way that they (and the Bible) use the word faith. They argue that faith is, and has always been, a term referring not to belief formation but to the volitional act of placing one's trust in a person or thing and acting upon it. On the most recent episode of Unbelievable Boghossian entered into discussion with Christian philosopher Tim McGrew and by all accounts was totally out of his depth. (I've had countless atheists tell me Boghossian is a terrible representation of their position and thought he was completely out witted by McGrew - as well he should be, they say.) What interests me for this post is that Boghossian claimed that his definition of faith as being a virtue of pretending to know what you dont know or believing in God without evidence was the majority view held by BILLIONS (yes "B") of Christians. He says that McGrew represented a few dozen people of McGrew's academic inner circle. To resolve the issue (or to start to resolve it anyway since no single survey could resolve it completely) Boghossian said that Unbelievable should put up a survey of it's listeners to have them vote on their definition and that he would be interested in the results. Ironically it was McGrew that had to step in to make the survey massively more accurate by separating out the Christians from the non-Christians. This keeps the survey about what Christians themselves mean by the term. The results? 9 out of 10 people disagree with Boghossian. Now to be fair this could be simply due to the kind of people who listen to the Unbelievable show. Maybe they are more educated and trained than the average pew sitter. It is possible. But this definitely shows that Boghossian's claim that his is THE majority view (despite the Oxford English Dictionary and nearly every theologian down through the centuries disagreeing with him) is hopeless flawed. So the question remains: Will Boghossian accept this evidence that his definition is not how Christians use the term or would he continue have "faith" (his definition") in his own deception? 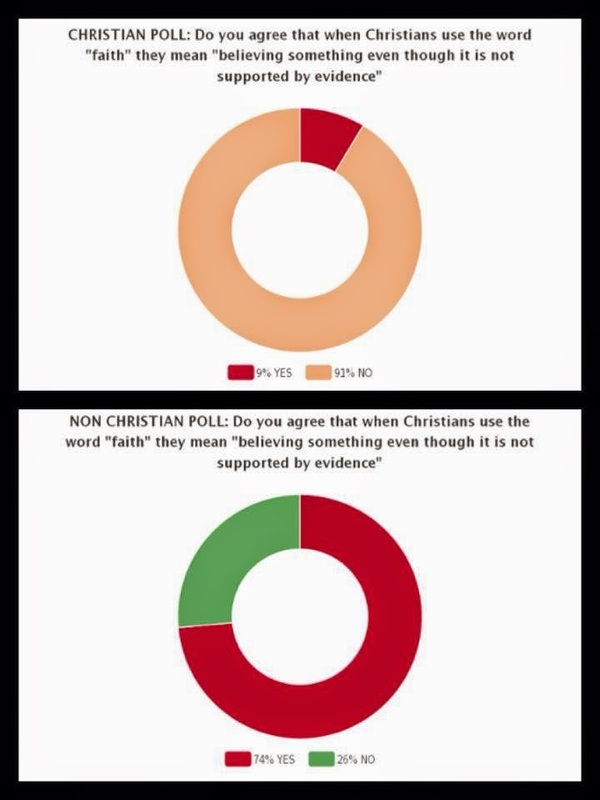 This poll demomstrates vastly different ideas between believers and non believers of what qualifies as "evidence".